A Catholic Life: Who was St. Cloud? Those who lived in Minnesota will be familiar with the city of St. Cloud, MN. But do many of them know who St. Cloud was? St. Cloud is an often unknown saint to most people - even to Minnesotans. St. Cloud's feast day is September 7th. "Saint Cloud is the most illustrious Saint among the princes of the royal family of the first French dynasty, the Merovingians (499-752). 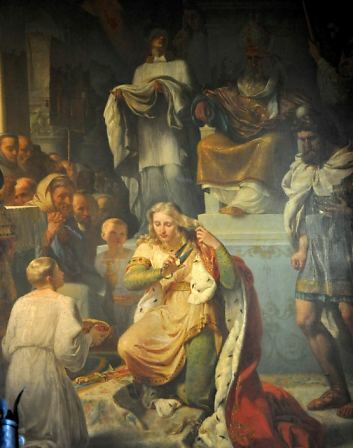 Born in 522, he was the son of Chlodomir, King of Orleans and eldest son of Clovis and Saint Clotilda. He was not yet three years old when his father was killed during a war. His grandmother, Saint Clotilda, brought him and his two brothers to Paris to be educated, and loved them dearly. "Their ambitious uncles, however, desiring to divide the kingdom of Orleans between themselves, slew with their own hands the two young brothers of Cloud. He, by a special dispensation of Providence, was saved from the massacre. Later, renouncing the world, he privately consecrated himself to the service of God. After distributing to the poor what he could salvage of his heritage, he retired to a hermitage to be under the discipline of a holy recluse named Severinus, who dwelt near the gates of Paris and who clothed him with the monastic habit. His uncles left him alone, seeing his inalterable decision to live as a religious, and conceded certain heritages to him. When he became famous through an act of charity rewarded by a miracle, he withdrew secretly to Provence. There again, his hermitage was sought out by petitioners. He decided to return to Paris, where he was received with the greatest joy. "At the earnest request of the people, he was ordained a priest in 551 by Eusebius, Bishop of Paris, and served the Church of that city for some time in the functions of the sacred ministry. Again he found himself in great honor; he, therefore, retired to Nogent, a place now known as Saint Cloud, two leagues south of Paris, where he built a monastery. There he was joined by many pious men, who fled from the world for fear of losing their souls in its midst. Saint Cloud was chosen by them to be their Superior, and he animated them to virtue both by word and example. He was also indefatigable in instructing and exhorting the faithful of the neighboring regions. He died at Nogent in 560, and the major part of his relics remain still in the parochial church of the village. "Reflection: Let us remember, as Saint Cloud did, that he who ruleth over men must be just (II Kings 23:3), and that it is by faith that the just man lives. (Cf. Galatians 3:11)."